Choosing Leigh and Marni as our doula team was by far the best decision my partner and I made in preparing for childbirth. They have tremendous enthusiasm for the work they do, and they treat each other and their clients with palpable care, respect, and love. Before we met them, we wondered how we could possibly hope to find a person we would like and trust enough to invite them to be present for perhaps the most intimate experience of both our lives; but after our son was born, it seemed impossible to imagine the experience without them. When I first met Marni and Leigh when they came to my apartment for an initial interview, I didn’t want them to leave. I felt immediately at ease with them and felt my shoulders drop as we eased into getting to know each other. Later, when I went into labor with my first baby I felt again that sense of overwhelming relief at seeing Marni when she arrived at our apartment, and later when Leigh came to the hospital to relieve Marni. My labor was so long that I got to experience both of them as doulas. There are so many things I could say about this amazing duo — that they’re never too preachy, that they really know how to listen, that they will tell you everything you need to know about giving birth, breastfeeding and postpartum care — but I want to focus on their stamina and grace. Marni stayed by our sides for more than 24 hours. When it was time for me to push, she brought in Leigh so that I could have a fresh coach, full of pep and energy to see me through to the end and help with my recovery and initial breastfeeding. 24 hours plus!!! And through it all, Marni was patient, kind and full of helpful techniques as I labored. There was a moment in my labor that I think back on often where I started to doubt myself and the process. I said the thing I promised myself I wouldn’t say — I told Marni “I can’t do it!” She held my gaze and reassured me that yes, I could and shared with me how we’d work through each contraction together. That moment happened well before I was admitted to the hospital and I really needed it. Because of Marni’s strength, both emotional and physical (as she gave me deep back pressure that I requested with each contraction), I pushed aside my self-doubt. I could do it because Marni said I could and I trusted her completely. It is with out any reservation that I can HIGHLY recommend the doula services provided by Leigh and Marni. They were incredible through out the entire time they were with us. I actually hired them at almost 38 weeks pregnant. !! Things didn’t feel right at the end there with the doula we had been working with and we decided to look for someone else. Marni had helped a good friend of mine deliver at Methodist a few months earlier. I was lucky to find such strong doulas so late in the game. From the moment they took on our pregnancy, we felt better. During the prenatal meetings, both Marni and Leigh were super friendly, warm, so knowledgable, and practical. They asked all the right questions, gave us excellent advice for dealing with early labor, and spent time doing hands on practice with me and my partner. I was also very impressed by the notes they sent after the visits. It was clear they had been listening and paying close attention to what we wanted. I have to admit that when my wife first mentioned that she wanted to hire a Doula to help with her labor I was a bit skeptical. I thought we could just wing it and get through the labor on our own. As it turns out, I couldn’t have been more wrong. 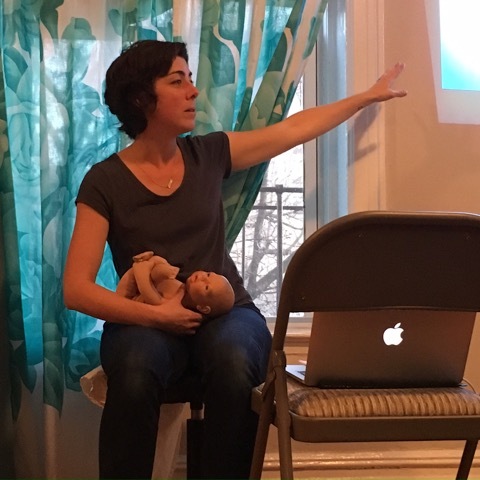 We were fortunate to meet Leigh at our birthing class and after seeing how knowledgeable and passionate she was about child birth, we decided to work with her and Marni as our doulas. Both Leigh and Marni spent hours with us in our home discussing my wife’s birthing plan and talking to us about everything from the stages of labor, to coping positions, to what to pack and indulging us as we went through all the crazy “what if” scenarios that were going through our heads. Leading up to labor, Leigh and Marni were both available via text and phone at all hours of the day and night to answer questions and always responded immediately. I have nothing but the best things to say about these two ladies. I did a lot of Doula phone interviews and a few in-person, and my husband and I immediately connected with Marni & Leigh. This was important for us since they would be part of such a personal experience. We loved how relatable they were and we liked how they were a team. It reassured us that we would be in great hands with either of them and not to worry another birth would get in the way. Leigh has training as a childbirth educator, which I thought was a big plus. It was a huge help for my husband when she arrived at our home (while I was in labor) - she immediately helped support me, applying counter pressure and helping me try different positions. 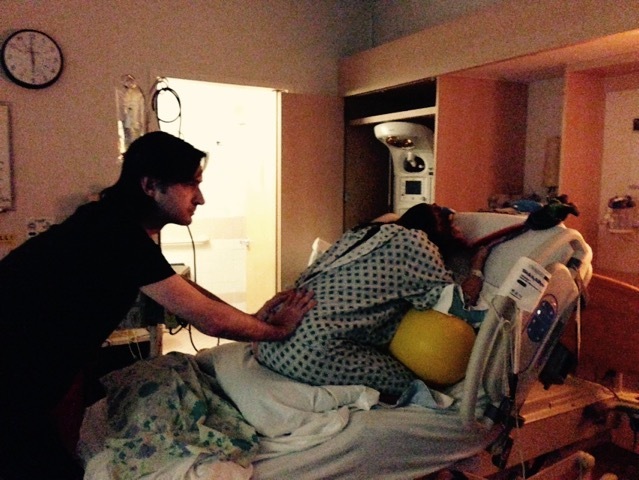 At the hospital/birthing center, she continued to be amazing. My labor “stalled” for a little from 7-8 cm, which was REALLY tough, and my baby was turned in a funny position which was making it tougher for me to progress, and Leigh really helped me do different walking techniques and positions to help turn the baby around! My first meeting with Marni I was 7 months pregnant. She immediately made me feel at ease. We effortlessly had a long conversation about the birth plan. I really didn’t have a plan and just expressed my fears and what I wanted to happen (or NOT happen). She helped me take ownership over what I would like to happen and not feel like I need to just let it happen. Marni guided me to resources that helped me feel better about the birth ahead. She also did not judge me for wanting to have an epidural but gave me honest facts about it as well. My husband’s biggest worry about us having a doula was that it would interfere with our birth experience but Marni immediately assured us it would be ok if we wanted our personal time.